January 25, 2016 0 comments on "Copycat Lofthouse Sugar Cookies"
I tried a bunch of new cookie recipes this holiday season. These cookies are a copycat recipe of Lofthouse’s famous sugar cookies. This would be a great recipe for Christmas or for Valentine’s Day (or any time!). I have tried many different sugar cookie recipes, but these are different in that they are softer and bigger than regular sugar cookies (the secret to Lofthouse-style sugar cookies). I think it is the sour cream in the cookies that make them softer. Note: This recipe makes A LOT of cookies, so they are great to make to give away or to serve at parties. It will make between 5-6 dozen cookies. You could always cut the recipe in half. In a medium sized bowl, mix together flour, baking powder, baking soda, and salt. In a larger mixing bowl, beat together butter and sugar until well mixed and it starts to get fluffy. Add eggs. Next add peppermint extract and sour cream. Mix well. Add flour mixture, mixing until just combined. The dough needs to be refrigerated. Divide the dough into two halves and wrap them plastic wrap. Refrigerate for at least 2 hours. Roll dough to 1/4 inch thickness. Add a little flour if necesssary if the dough is too sticky. Use a round cookie cutter about 2 inches across to cut out the cookies. I used my biscuit cutter. Bake about 7 minutes. The cookies should still be light in color, not brown. Cool on waxed paper or wire racks. While the cookies are cooling, crush the candy canes (you will need approximately 12 candy canes). I crushed mine by placing them in a gallon sized ziploc bag and crushing them with a rolling pin. After the cookies have cooled completely, prepare the frosting. Beat the butter until soft and fluffy. Add peppermint extract. Slowly add the powdered sugar until combined. Add salt and milk and continue beating until fluffy. Frost the cookies. 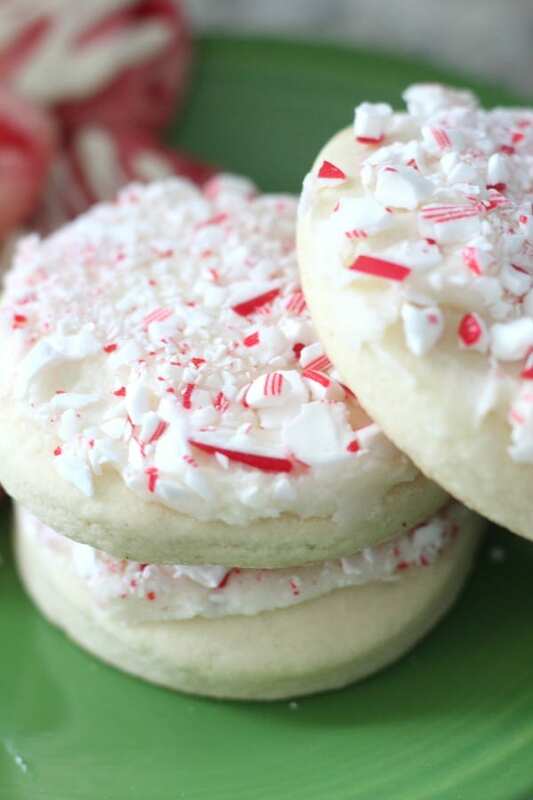 Place the crushed candy canes in a bowl and dip each frosted cookie in the crushed peppermints. 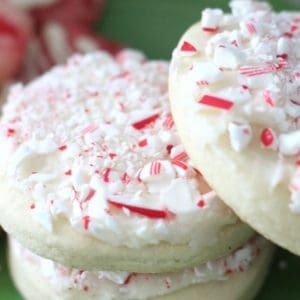 Note: If you are making these cookies for Valentine’s Day and can’t find candy canes at the store, you could crush any kind of peppermint candies instead. I think these cookies would also look great for Valentine’s Day if you use some food coloring to make the frosting red or pink, or use several different colors to create variety.